MELEM USA LLC - Note: orders placed between Feb. 23, 2019 and March 4, 2019 will be shipped March 6. 2019. This page is for ordering using the Pay Pal system world wide and is the only way to order most combo packs, half cases, and sample packs, and to take orders from outside the USA. Canadians can also use either this site or Amazon. www.amazon.com . Search Melem Skin and Lip Balms. Amazon offers items #1005,1008,1009, and 1010. Highly recommended is to use Amazon.com, the US e commerce site, for shipments outside of the US. By ordering on Amazon, you do get extremely low shipping rates with the price to US customers plus shipping . For example, cost of shipping to Europe is around $6 USD. ﻿All item prices on this page/site include shipping.Pay Pal takes almost all credit cards and converts to your local currency. You do not need to be a Pay Pal subscriber. USA customers can order #1005, #1008, #1009 and now #1010 from both this site and on Amazon (www.Amazon.com/Melem) . 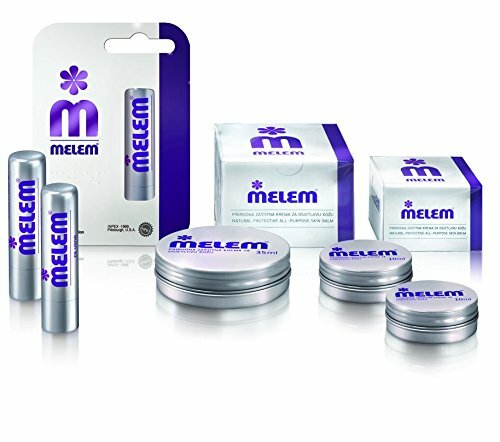 Melem is eligible for Amazon Prime..where you may get free and 2nd day shipping, but you can still order on Amazon even if you are not a Prime member. . New on Amazon, but not on this site: single melems can be bought. Price including shipping: mini tins: $5; large tin: $14; lip balm stick: $6. Make up your own multi pack and combo packs on Amazon if you do not find what you want here. Orders of single pieces are currently available only to US customers. New below and available only on this site is the sample pack with one each of the Melem products. If you are not sure which to order, try this. Great for gifts and if you want two order two or more of each. This is #2007. USA and Canadian orders have different item numbers than non USA and Canadian orders due to shipping, packing, and handling cost differences..﻿Puerto Rican orders are treated the same as US and Canadian orders. .Scroll down to items #1110-1123 for non USA/Canadian orders. All prices quoted here include shipping and handling. For full case orders, visit www.melemwholesale.com. Shipping is by US Post Office First Class mail. . Tracking numbers are not available to locate your package if they are shipped to an address outside the US and Canada. Allow 10 days to two weeks for delivery outside the USA. Note: orders placed between Feb. 23, 2019 and March 4, 2019 will be shipped March 6. 2019. This page is for ordering using the Pay Pal system world wide and is the only way to order most combo packs, half cases, and sample packs, and to take orders from outside the USA. Canadians can also use either this site or Amazon. www.amazon.com . Search Melem Skin and Lip Balms. Amazon offers items #1005,1008,1009, and 1010. Highly recommended is to use Amazon.com, the US e commerce site, for shipments outside of the US. By ordering on Amazon, you do get extremely low shipping rates with the price to US customers plus shipping . For example, cost of shipping to Europe is around $6 USD. ﻿All item prices on this page/site include shipping.Pay Pal takes almost all credit cards and converts to your local currency. You do not need to be a Pay Pal subscriber. USA customers can order #1005, #1008, #1009 and now #1010 from both this site and on Amazon (www.Amazon.com/Melem) . Melem is eligible for Amazon Prime..where you may get free and 2nd day shipping, but you can still order on Amazon even if you are not a Prime member. .
New on Amazon, but not on this site: single melems can be bought. Price including shipping: mini tins: $5; large tin: $14; lip balm stick: $6. Make up your own multi pack and combo packs on Amazon if you do not find what you want here. Orders of single pieces are currently available only to US customers. New below and available only on this site is the sample pack with one each of the Melem products. If you are not sure which to order, try this. Great for gifts and if you want two order two or more of each. This is #2007. USA and Canadian orders have different item numbers than non USA and Canadian orders due to shipping, packing, and handling cost differences..﻿Puerto Rican orders are treated the same as US and Canadian orders. .Scroll down to items #1110-1123 for non USA/Canadian orders. All prices quoted here include shipping and handling. For full case orders, visit www.melemwholesale.com. Shipping is by US Post Office First Class mail. . Tracking numbers are not available to locate your package if they are shipped to an address outside the US and Canada. Allow 10 days to two weeks for delivery outside the USA. Not sure what to order? Try the sample pack which has one large 1.2 oz Melem, one mini Melem, .34 oz; and one Melem stick balm. This also makes a nice small gift, too. Buy multiple ones if you want more than one of each. Includes shipping. Three 1.2 oz (35 ml) containers of Melem Skin and Lip Balm including shipping. Six .16 oz (4.5 g) Melem lip balm sticks including shipping. One large 1.2 oz tin, two mini tins and two lip balm sticks including shipping. Contains one large Melem tin (1.2 fl oz; 35 ml), two mini Melem (.34 oz or 10 ml) tins; two Melem lip balm sticks , including shipping.